Hawksbill turtle (Eretmochelys imbricata), Green turtle (Chelonia mydas). Blacktip Reef shark (Carcharhinus melanopterus), whitetip reef shark (Triaenodon obesus). Grey reef sharks (Carcharhinus amblyrhynchos) – 40 during a single trip! Spotted eagle ray (Aetobatus narinari), Feathertail stingray (Pastinachus sephen), Mangrove whipray (Himantura granulata). Barracuda (Sphyraena barracuda), Napoleon wrasse (Cheilinus undulates), Bumphead parrotfish (Bolbometopon muricatum). 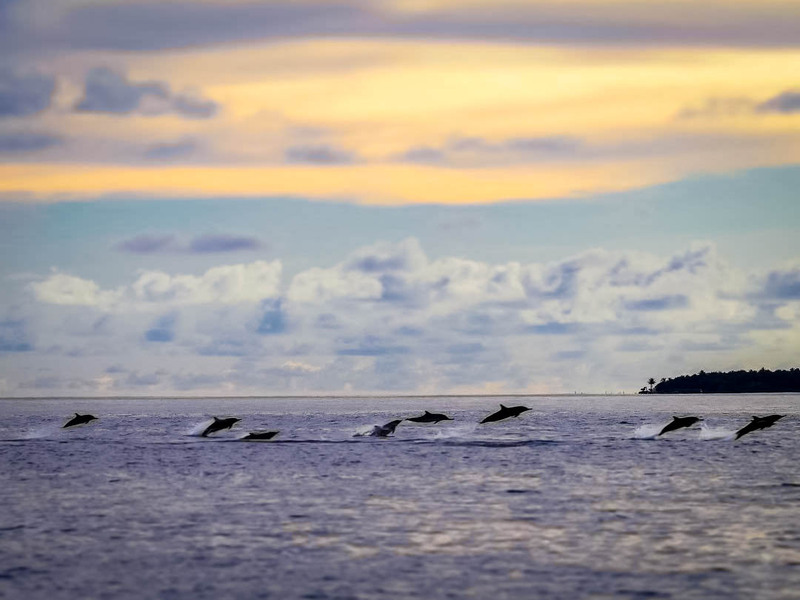 We experienced several outstanding encounters during March, including observing 50 Spinner dolphins underwater during a dive, and following a pod of Short-fin pilot whales (Globicephala macrorhynchus) in our boat for almost an hour. 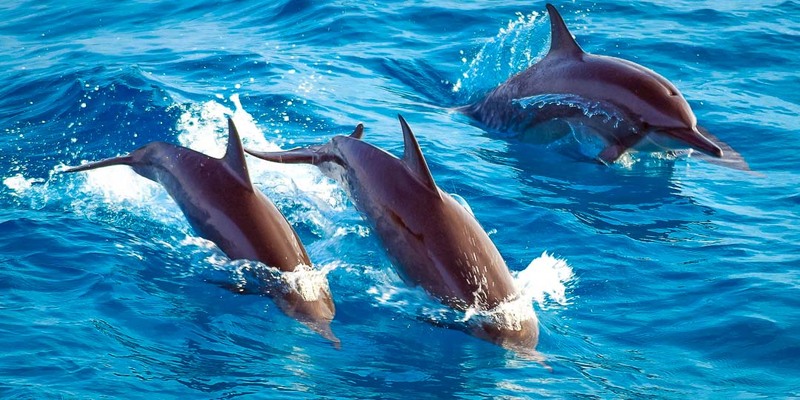 Recorded pods of Spinner dolphins (Stenella longirostris) ranged from 20 to 150 individuals, and interestingly, one lone Spinner dolphin was spotted, a very unusual occurrence as these animals are highly sociable. Nevertheless, this dolphin seemed to enjoy bow-riding alongside our boat, swimming with us for 25 minutes as we cruised around the atoll. We are continuing to take dorsal fin photographs for our Dolphin ID project, and currently have 82 individuals in our database. In our Fish Lab at Landaa Giraavaru, the seahorse and baby lobster are eating and growing well; the lobster has undergone a moult and is very active during feeding time; the seahorse is also seen actively hunting its prey. 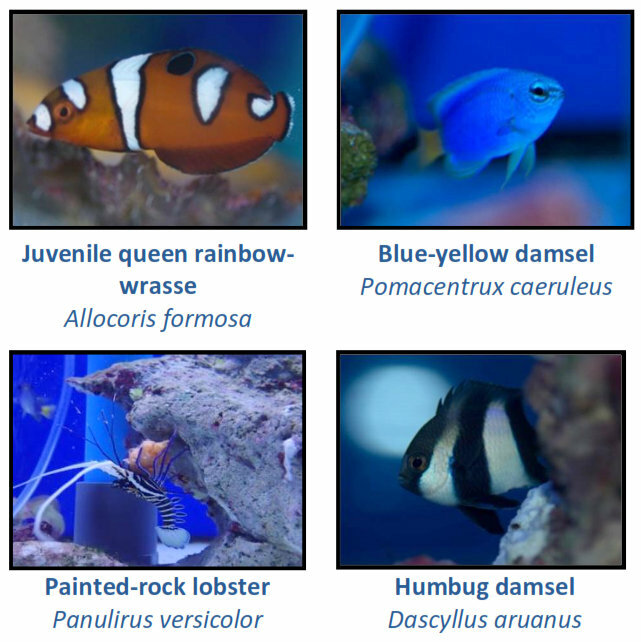 Our Maldivian Clownfish (Amphiprion nigripes) breeding pairs are laying more eggs than the Clark’s Clownfish (Amphiprion clarkii), but unfortunately tend to eat most of them! We assume the Nigripes adults are rejecting food in preference to eating their own eggs. To resolve this, we are experimenting with different feeding techniques (for example, by alternating food pellets and a Selco/shrimp mixture). Our anemone project started back in February, with three specimens collected from Kamadhoo reef, plus a further two collected during March. Following various bisections, we now have 13 anemones from the 5 originals, and the resulting parts are doing well (see the schematic family tree). 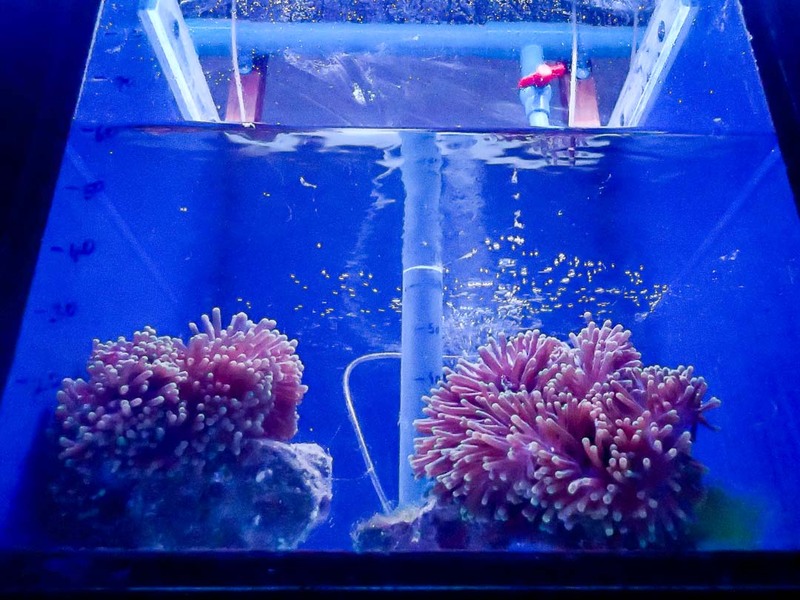 We relocated six anemone segments to empty tanks in the indoor Fish Lab, but they started to bleach in less than one week so we promptly returned them outdoors. (It seems that our new tank illumination is not powerful enough). 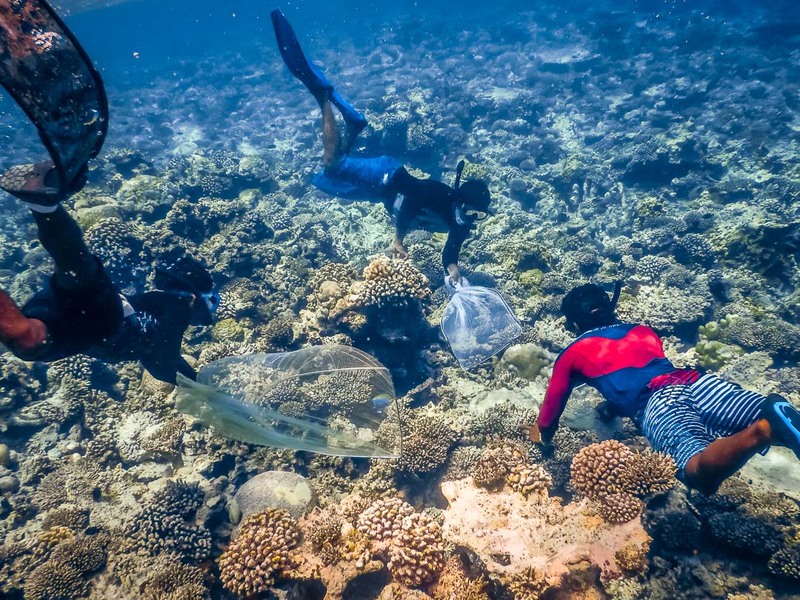 Thanks to our coral biologist and all-round intrepid explorer, Sara, we found an aggregation of hundreds of nudibranchs at Landaa Giraavaru during March. We observed a large area (20m x 20m) covered by these nudibranchs, averaging 10 animals per square metre. Many were actively mating or laying orange egg ribbons. We collected a small egg sample for our Fish Lab, to better understand more about these curious and beautiful animals. 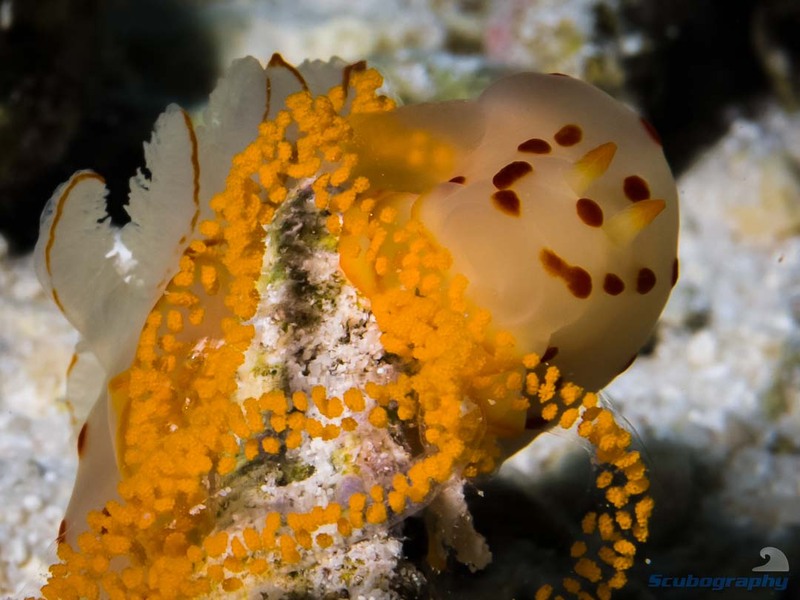 The species is Gymnodoris ceylonica, characterised by the translucent white body with small bright orange-red spots and large orange-lined white gills. First reported by Kelaart from Sri Lanka in 1858, this animal is widespread around the Indo-Pacific oceans. Often known to occur in large aggregations, it is theorised they move from deeper water to spawn and mate in shallow areas (Whitehead, Paul, 2006). A big thank you to our professional photographer Simon Hilbourne from Manta Trust and Scubography.